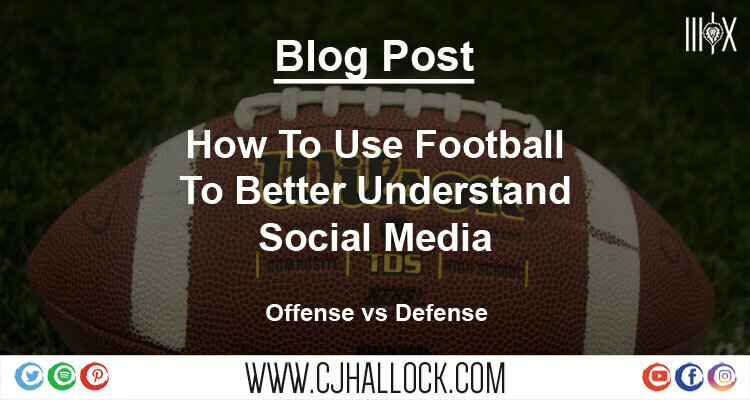 So with College Football starting, I thought now would be a good time to cover the comparison between football and marketing on social media. Yeah, I said that! The old saying, defense wins games, is true. But with social media, it gets a little deeper. Let’s say you just opened a restaurant and getting ready for your grand opening. You don’t think social will bring any visitors so you put all your budget in flyers. After taking a few hours going through the mall, grocery stores and window shopping handing out flyers, you build a solid buzz. The Grand opening is here and you have a slammed dining room. With a 30 minute wait at the door, you couldn’t be happier. Now the kitchen is running slow and one of your customers happens to be very active on social media. A single post on Twitter about a burnt steak now has you in Defense. Reply back and offer to comp the meal. But he still had a burnt steak. Yes, in football, if you have no defense and your opposition runs the score up, you lose. But, if you never score you can never win! This is where the social media game is won. Using the free tools to truly get to know your customers more on a personal level is what gets you … Fanatics. Talking about your business all day will get you fair weather fans. Fair weather fans will occasionally like a post or even share one when you are running one of those mega sales offering 50% off or free dessert on Tuesdays. Fanatics will support you and shop at your establishment … FOR LIFE!!! Just like football, you need to train a bit different depending on what field you are playing on. Turf requires different cleats than natural grass. The different platforms have different things that perform better. Have Fun, and keep all videos posted (that you upload and own rights to) needs to be below 2 minutes … the shorter the better. Instagram – Yes, it is still technically Facebook but, we have different rules for the kind of posts. While you still need to watermark all of the images you post, the type of pictures that work is a little different. All pictures will work but images with 30% of the image being in the foreground and the remaining 70% being faded out in the background are the highest converting images (from my research, it may be different for you) Read the Ultimate Instagram Guide here. Pinterest – This gets complicated because you are not making but 1 pitch on here for every 15-20 pins. I am not saying don’t pin your blog. Simply put, if you are pinning an image/video that has a CTA (Call to Action) you need to have 15-20 content pins in between these. People will not follow you or your boards if all you do is post pins that are no more than … “We are running a HUGE SALE!”. On this platform, 90% of successful images pinned are short and long-form infographics. Twitter – Images do work on this platform but the text is #1. Do not use this platform just to pitch (like other platforms). This platform is used to listen. Go to http://search.twitter.com and search for your keywords. See if anyone is asking questions about what you do and answer them. It’s that simple! Let’s say you are a plumber and the tweet you find is “Putting in a new sink in the bathroom and I can’t stop the leak from the pipe that connects to sink underneath” … What you would do is follow up with a solution for them to fix it. Ask what they used to connect it and truly try to help them fix the problem. Don’t say here is a video that might help and shoot them a link to your blog. Walk them through it and if, after a few messages back and forth, they are having issues understanding then send the post. “Obviously I’m not good at explaining via text enough for you to understand, I did a video on this a few weeks back that might help you, here: http://yourname.com/blogname” or seriously over deliver and record them a personalized video if you can. Yes, there are many more platforms you can use but for time consideration I’m going to stop here and just give you a list of some other platforms. Status Update / Micro-Blogging – This is normally a shorter text post around 100-140 characters. Thank a customer, share a positive thought/tip, give updates on products/services etc. Blog Post – This is what you are reading. Long form text. Some platforms offer blog capabilities other don’t. On Facebook, it is called “Notes”. Blog Posts are used to go into detail about a thought. Normally at least 300 words and sky is the limit. While I wouldn’t recommend going over 1,400 words if you feel it is necessary then write away! VSP – (Visual Status Post) this is a simple square image used on platforms like Facebook, Instagram, Pinterest, and Twitter. BPC – (Blog Post Cover) This image is used as the “Cover” for your blog posts. Normally they look close to the same, sometimes created from a template. You can see an example at the top of this page. These grab social media users attention to make them want to click and visit your site. Infographic – This is normally only used on Facebook and Pinterest. This works as the image’s version of a blog post. Normally it is a long image with a bunch of information on it. Video – Like images, you want to watermark your images but more important is the title and description. Keep it detailed and informative. MicroVideo – This is like Twitter for video. Normally 6-15 seconds long. short fun videos. Video Blog – This is when you get behind a camera and share thoughts within your niche. These can be from 1 minute to 30 minutes. Just remember that the longer the video the lower the chances of people watching the entire thing. Promo Video – This is normally a 20-45 second video highlighting the services and/or products you offer. Very similar to TV Commercials but just shared on platforms like YouTube, Facebook, and Twitter.